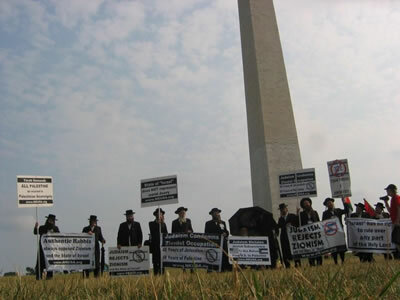 A large delegation of Anti-Zionist Orthodox Jews travelled to Washington, D.C. to join other protesters condemning the Zionist occupation of Jerusalem, the Holy Land, and Palestine. Zionists have occupied Gaza and the West Bank for forty years and Palestine for fifty-nine years in the name of the so-called "State of Israel." 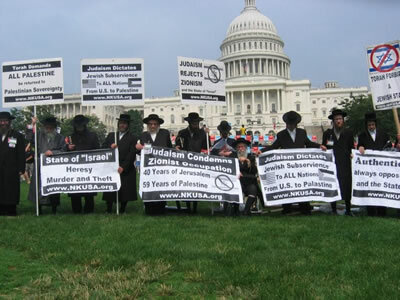 Torah Faithful Jews denounce the creation of a Zionist state as totally contrary to traditional Jewish beliefs and teachings. On the occasion of forty long years of the occupation of Jerusalem and fifty nine years of the taking of the entire Palestine, the Jewish communities faithful to the teachings of the Almighty and the Torah, in their respective countries, gather to commemorate this anniversary as a time of sorrow and tragedy. 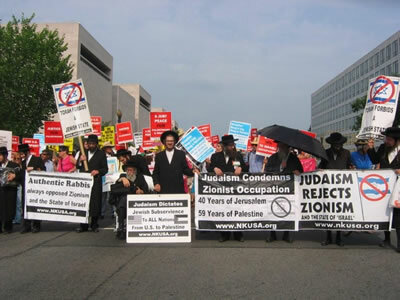 Anti Zionist Orthodox Jews mourn the deportation, subjugation, and oppression of the Palestinian people. The Zionists will have you believe that their occupation is the will of the Almighty and the fulfillment of the Torah. Nothing could be further from the truth. 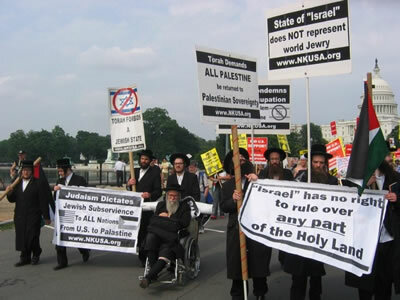 The founding of the State of "Israel" is in direct contradiction to the teachings of the Torah which forbids the establishment of a Jewish state and commands Jews to remain in exile until released from that exile by the Almighty Himself, without any human intervention, at which time all nations of the world will live together in peace and harmony. Torah faithful Jews are to behave in a civil, honest and grateful manner in their host countries throughout the world. The Zionist intervention against the Almighty's will be establishing the "state of Israel" represents an official rebellion against G-d and the Torah, a rebellion which has generated untold pain and suffering. 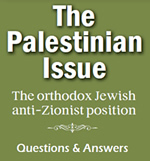 On the 40th anniversary of the occupation of Jerusalem and the 59th anniversary of the founding of the State of "Israel", true Torah Jews reaffirm that this Zionist establishment is illegitimate and simply an attempt to transform Judaism from a religion into a secular entity, its main goal, to uproot the Torah teachings. The Jewish people mourn the tragedies that the State of "Israel" has brought upon the Palestinian people. Likewise we decry the oppression of the religious Jewish inhabitants of the Holy Land and the flagrant violations of all that is holy in the sacred Torah. Desecration of the Sabbath, destruction of cemeteries and modesty mores, is but a few of the many laws that Zionism transgresses. In this tragic time we pray for a speedy, peaceful, and painless dismantlement of the heretical Zionist state of "Israel". May we merit that this year will be the year that all nations together, in the service of one G-d, can celebrate in a free Palestine and a free Jerusalem. AMEN.